It doesn’t happen often, but occasionally a watch appears that seems to be a real one-off. For me, this is one of them. I’ve never heard of the brand (the caseback is likewise stamped with Flash, and that’s all) the 223 is unusual, and the features, while I’ve seen them in other watches (the Citizen Memo-Melody springs to mind) it’s quite different to most knock-off watches. Most often copy watches would be exactly that, the pirates would replicate the circuitboard for features, then just use an identical LCD. 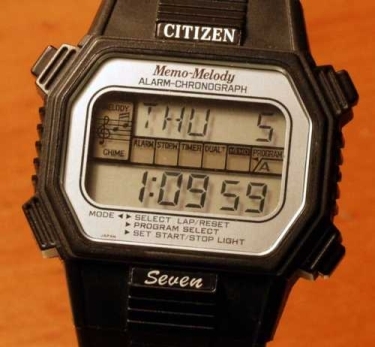 Not in this case (unless someone knows of a brand name watch exactly like this) where the LCD seems to be unique. I was pleased to pick this one up in NOS condition from an Italian eBayer who I traded some non-working LED watches with, and it arrived in great condition. There are two different memos you can set with the dot matrix display, and each are linked to an alarm (one melody which plays Big Ben and one non-melody) or you can trigger them individually at any time. It’s got an hourly chime, 12-hour time and date, and a stopwatch with running man animation which adds to the cool factor a bit. Setting the memos you have a choice of A-Z (capitals only), 0-9 and some symbols including phone etc. All in all it’s a great watch – lots of features, very rare and unusual, and in great working order. Keep an eye out for this one, but I’m still trying to find another watch that even looks like it, so you might be looking a while!